Saint Hyacinth, whom ecclesiastical writers are rightly wont to call the apostle of the north and one of the wonder-workers of his century, was of the house of the Odrowaz, counts of Konski, an old and noble Polish family. Some of his ancestors enjoyed palatine rights. To his line also belonged a number of military officers whose bravery and patriotism more than once proved their country’s bulwark against invasions by barbarian hordes. His great-grandfather, Saul Odrowaz, defeated the enemy in several bloody engagements. The saint’s grandfather, Saul Odrowaz, who gained an enviable reputation for courage by his martial exploits in the twelfth century, had two sons. Ivo, the younger, studied for the ministry, filled the office of chancellor for the king of Poland, became bishop of Cracow, and died with a great reputation for sanctity. Eustachius, the elder, married a lady whose piety ranked with her birth. God seems to have blessed their union with a fine family. Hyacinth, of whom we now write, was the eldest. According to the more common opinion he first saw the light of day in 1185. His birthplace was the Castle of Lanka, Kamin, in Silesian Poland, now a part of Prussia. The next sketch will be of a younger brother, or at least a near relative, Blessed Ceslas. Almost from the cradle, nature seemed to have disposed Hyacinth to virtue. His parents not only studiously fostered this happy disposition, but also used great care to procure for their son teachers who would protect his innocence. In this way, he was so well grounded in his religious duties that he passed through his higher studies at Cracow, Prague, and Bologna, without tarnish to his pure soul. Doubtless his model life had not a little to do in helping him to win the admiration of both his professors and fellow-students. God also blessed him with, a splendid mind. Thus, through diligent study, at Bologna he obtained the degree of doctor in canon law and theology. From Italy the future apostle returned to Cracow, whose bishop, Blessed Vincent Kadlubek, received him as a blessing sent by heaven for the good of his diocese. Father Hyacinth was at once appointed one of the canons at the cathedral, and soon afterwards became a member of the diocesan council. In this way, he not only took his part in the administration of the affairs of the great diocese; he was also a source of much consolation to the aged and saintly bishop. In whatever he undertook, or was entrusted to his care, the young priest showed rare prudence and ability. Furthermore, he ‘was zealous and pious. However manifold were his duties, the future Friar Preacher did not permit them to interfere with his good works, or to dampen his spirit of prayer, or to lessen his practice of recollection. None were more punctual or exact in the recitation of the divine office by the canons. He mortified himself in many ways. He visited the hospitals regularly, and the sick found in him a sympathetic comforter. A friend to the poor, he distributed his income among them; for he felt that money received through the Church could not be devoted to a better or more advantageous use. While Hyacinth was thus employed, edifying the clergy and people of the diocese, Bishop Kadlubek determined to resign his see that he might have more time to prepare to meet his God. This was in 1218. The Rev. Ivo Odrowaz, chancellor of Poland and uncle of Hyacinth, was then selected as Blessed Vincent’s successor. The bishop elect went to Rome in regard to his appointment. No doubt the journey was urged by King Leszek, the Right Rev. Vincent Kadlubek himself, and the cathedral chapter of Cracow, if not even by many of the hierarchy of Poland. On the one hand, the resigning prelate enjoyed too great a reputation for Honorius III readily to consent to his laying down the reigns of authority; on the other, the Polish authorities were not only content that the holy man should be allowed the rest he craved, but also anxious that the Diocese of Cracow should have as its head the one whom they judged the best fitted to take his place. Ivo Odrowaz took with him to Italy Saint Hyacinth and Blessed Ceslas. Both of them, because of their zeal, piety, good judgment, and learning, were among the most influential clergymen of the diocese. Doubtless, therefore, the bishop elect chose them that he might have the advantage of their counsel and knowledge. In the episcopal retinue were also Henry of Moravia and Herman of Germany — a fact, which, in spite of some contrary opinions, seems to prove that they, too, stood high in the ecclesiastical circles of Cracow. The Journey appears to have assumed the added character of a pilgrimage. But, in the light of subsequent events, one is justified in the belief that it was guided by a special providence. At Rome the little band met the Right Rev. Henry von Guttenstein, bishop of Prague. They also soon came in contact with Saint Dominic, the report of whose miracles resounded throughout the capital of Christendom, especially that of raising young Napoleon Orsini to life, which he had just performed. This was in 1218. The two bishops were so pleased with the holy man and his disciples that they besought him to establish his Order in Poland and Bohemia, where they held out every hope of great good that could be accomplished. This was precisely in line with Dominic’s wishes. Yet he felt that he should first attend to the needs of the countries nearer at hand; and his confrères were not yet sufficient in number to supply all demands. Another difficulty was the fact that none of those who had until then joined the new institute knew aught of the Polish or Bohemian languages and customs. The saint, therefore, urged the two dignitaries to wait until he should be better able to comply with their wishes. Henry von Guttenstein seems to have been content with this promise. But Ivo Odrowaz pressed his case, for he wanted the missionaries without delay. He declared that he would protect them, nay, be a father to them, and that they would be as well cared for in Poland as in their own native lands. No one, he insisted, knew the needs of his diocese better than himself. They were extreme, and could not be met any too soon. The suggestion pleased Cracow’s bishop. He spoke of it to those who had come with him — Hyacinth, Ceslas (both his nephews), Henry, and Herman. While, he said, his natural affections and personal interests disposed him to retain them about himself, he felt that he would render the country a great service by sacrificing them to the new Order, if they should like to join it. As it happened, all four of them had been no less impressed by Saint Dominic than Bishop Odrowaz himself. The holy man’s spirit had gained possession of their souls. Accordingly, the four, filled with the hope and desire of laboring as Friars Preacher, decided to enter the Order. They received the habit from the founder at Santa Sabina’s on the Aventine Hill. Father Touron places this event about March, 1218. Others say that it took place a year later; while some assign it to 1220. The precise date, although important, is of less consequence than the fact that the calling of the four men seems certainly to have come from heaven. They had already been thoroughly formed, trained, and educated for the priesthood, and had had no little experience. This now stood them in good stead; for through this, the grace of God, and the masterful guidance of Dominic, they made marvellous progress in their preparation for their new life. The saint kept his promise to the bishop of Cracow. He did not wait until they had made a year’s novitiate. When he felt that they were prepared for the work of the Order, he used the extraordinary power given him by Honorius III, and permitted them to take their vows. Then he sent them, perhaps with a few others, to the field of labor which had been determined for them. 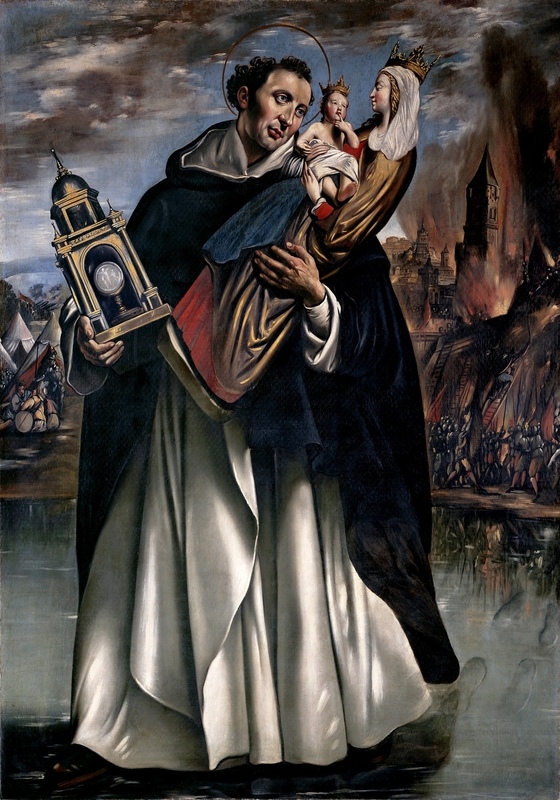 Possibly nowhere does a reflection, which often occurs to the reader of Saint Dominic’s history, present itself with greater force than in connection with Saint Hyacinth and his companions. How could the founder of the Friars Preacher prepare men in so short a time to announce the word of God with extraordinary success, while such a training, in the natural course of things, requires years? None of those mentioned in this sketch, though they were educated men, had been specially drilled in sacred oratory, or distinguished themselves by their eloquence. Yet, after the few months spent in the novitiate at Santa Sabina’s, their preaching was all but resistless, and drew immense crowds wherever it was known that they were to appear. To the writer at least it appears that such a phenomenon can not be accounted for in any natural way, even though, as must be admitted, Saint Dominic possessed a marvellous personal magnetism, and was endowed with rare gifts for inspiring others with his enthusiasm. The only satisfactory explanation of the fact is that the great and sudden change was the work of grace. Like the apostles of old, after the day of Pentecost, they were different men. Hyacinth, who was then thirty-three years of age, received the appointment of head of the little missionary band. Whether or not Bishop Ivo Odrowaz remained at Rome until the new Friars Preacher made their religious profession, as Father Touron thinks, they did not form a part of his episcopal train on the return journey. (11) Taking another course, they passed through the territory of the former Republic of Venice into Carinthia, and founded a convent at Friesach, in the northern part of that duchy. The Most Rev. Eberhard von Truchsen, archbishop of Salzburg, received them all the more cordially because he had met Saint Dominic at the fourth Lateran council, Rome, in 1215, and had asked him for some of his disciples. Doubtless it was at the archbishop’s request that the house was established at Friesach. During his six months’ stay in Carinthia Saint Hyacinth really began his wonderful career. People flocked in enormous numbers to hear his sermons. He gave the habit of the Order to many, among whom were not a few clergymen. Then, with the powers conferred on him by Dominic, he instituted Father Herman of Germany superior of the house; for, as Polish historians tell us, he was a man of exemplary life, as well as possessed of great zeal, prudence, and oratorical ability. Hyacinth, Ceslas, Henry, and some others now continued their way towards Cracow in accordance with their promise. However, they labored as they passed through Styria, Austria, Moravia, and Silesia. The report of their sanctity and eloquence had preceded them in all these places. As Father John Croiset, S. J., correctly states, the fervor of their preaching was such that the people everywhere soon recognized that the new religious institute was composed of truly apostolic men. By this time our saint’s extraordinary life was fairly under way. Not in Cracow only, but throughout his native land word was scattered abroad of the wonderful things that God effected through his ministry. Thus, as he passed through Poland, immense crowds met him with every expression of joy and esteem; and it could easily be seen that it was the ambassador of Christ, not the nobleman, whom they sought to honor. In his well-balanced humility, Hyacinth, who had not been used to such things in his younger years, referred it all to God, of whom he was only an agent. At Cracow itself, the bishop, his clergy, and crowds of every station in life received the former canon of the cathedral as an envoy from heaven. In accordance with the request sent by Honorius III, they left nothing undone in order to facilitate the Friar Preacher’s mission. God blessed his sermons from the start. Enmities, pride, and rivalries were laid aside. Sinners gave up their evil ways. Those who had long neglected their religious duties began to hear mass and receive the sacraments. Cracow soon became a different city. Bishop Ivo Odrowaz must have taken a keen spiritual pride in his nephew, as well as have been thoroughly convinced that his vocation was divine. It must be admitted, writes Adrian Baillet, that such marvellous effects were the work of God rather than that of man. It is impossible to write a sketch of Hyacinth’s life that would be worth the while without playing the part of the hagiographer, no less than that of the historian. Indeed, however appealing his words and the example of his saintly life, there can be little doubt but that his labors would have been far less fruitful in good, had they not been supported by the gift of miracles. Writers of history mention many of these, which gave great éclat to his apostolate from the start. However, as the saint himself ever sought to cover them under the cloak of humility, we shall follow his example, and mention only those marvels which are so connected with some trait or fact of his life that they can not be omitted without obscuring the course of his missions. Suffice it here to say that he was not content to tear up the cockle which the enemy had sown in with the Lord’s good grain. He ever sought to stabilize his work by the introduction of religious practices in the place of the vices against which he waged incessant war. This is what he accomplished in the city and diocese of Cracow, where even many of the high-born were soon so changed that they became models of docility. While Hyacinth was engaged in this work of reformation, the bishop, his cathedral chapter, and the magistrates of the city acted in concert to bestow the Church of the Holy Trinity in Cracow on the Order, erect a convent, and furnish it with the necessaries for a religious community. Large as was the house, it was soon filled with ardent subjects. Trained under his care, and filled with his spirit, they extended the work of reform with signal success to the furthermost parts of Poland. Among those whom the apostle of the north received into the Order at Cracow was a noted Roman doctor, James Crescenzi, whom an uncle, Cardinal Gregory Crescenzi, had brought from Italy in the capacity of secretary and counsellor when appointed papal legate to Bohemia and Poland. Hyacinth’s sermons so won the admiration of this young ecclesiastic, and fired his zeal, that he decided to become a Friar Preacher. He felt that in no other life could he more surely save his own soul, or do more for the extension of the kingdom. of Christ on earth. The cardinal legate, while he naturally disliked to lose the assistance of his kinsman, was too pious a man to interfere with his vocation. As a zealous preacher Father Crescenzi attained no little reputation. Dominic’s promise to Bishop von Guttenstein of Prague had not yet been fulfilled. When, therefore, the convent of Cracow was well on its feet, Hyacinth sent Ceslas, Henry of Moravia, and others to establish themselves in Bohemia. He himself continued his, work through the provinces of Poland, where God sanctioned his efforts with frequent wonders. Everywhere he met with the same success that had crowned his toil in Cracow. Requests for Friars Preacher came in from various places. For this reason, Hyacinth founded a convent at Sandomir, capital of a palatinate of the same name in Little Poland. He built another at Plock, on the Vistula and in the old Polish Province of Warsaw. At both these houses he gave the habit to many whom his preaching, saintly life, and miracles won to the Order. Thus, like that in Cracow, they became centers from which the entire kingdom was supplied with missionary workers. Not only did the three missionaries obey; all four passed over the raging stream as though it had been the smoothest road. This marvellous occurrence happened in plain view of many in Vissegrad. One may thus easily imagine the effect his preaching had on the people of the town. It was one of the outstanding miracles brought up at the time of the saint’s canonization. Hyacinth had drunk in deeply the spirit of Dominic. Like the founder of his Order, he ever dreamed of new spiritual conquests for the Church and more souls to be saved. When, therefore, religion was renewed in Poland, leaving his confrères to continue the good work there, he wended his way towards the remoter and more barbarous north. There he knew were vast numbers either still buried in the darkness of idolatry, or adherents of the eastern schism. No distance, no peril, no hardship, no lack of comfort or climatic condition could dampen the ardor of the zeal which consumed him, so Iono, as there was hope of extending the kingdom of Christ. He was ready joyously to suffer any and everything for God and the spiritual welfare of his fellow man. From Poland the apostle took a number of Friars Preacher on this journey. Heaven blessed their endeavors with many conversions. Wherever he saw a prospect of permanent good he began a convent, and left some of his confrères to spread the light of the Gospel. Often he was left alone on his peregrinations. Although he was ignorant of the languages spoken by the various peoples in whose midst he came, he preached without an interpreter, and was understood as though he spoke their own tongues. It was like a renewal of the apostolic age. Miracles, so to express it, walked in his footsteps. While they did not always bring conversions, they at least combined with his sweet character to protect the ambassador of Christ and to make him loved. Among the convents which the leading citizens of Pomerania, Prussia, and other places along the shores of the Baltic Sea had Hyacinth erect for them were several that became noted centers of spiritual activity. Such, for instance, was that at Kammin, on the Oder. Another was the convent of Przemysl, on the San. Kulm, Elbing, Königsberg, and Dantzic also had their great houses of Friars Preacher, which furnished many missionaries for the Lord’s vineyard. Nor must we forget the one situated on the island of Rügen, out in the Baltic Sea, just off the mainland of Prussia. All these, and more, were the fruit of the toil of the apostle of the north. That in Dantzic, as we shall soon see, has a beautiful and interesting bit of history attached to it. To not a few of our readers, no doubt, it will be a surprise to learn that, when Saint Hyacinth went to Prussia, he found worship of the devil broadcast. Despite edicts against the impious and sacrilegious practice, myriads, who were still sunk in the darkness of idolatry, tenaciously clung to their idols, adored them with incense, and even honored them with abominable sacrifices. Others had tried to enlighten and convert these benighted people, but failed. Our Friar Preacher undertook the task, and succeeded. Here again, in the beginning, miracles were his most effective weapon against the powers of evil. Wonderful cures of the sick first won him the confidence and affection of the barbarians. Then by his sermons and instructions he not only led them to destroy their temples and burn their idols, but also to embrace the true faith. It was a glorious achievement. That this good work, so happily begun, might be rendered durable by a thorough instruction of the people, the saint asked the duke of Pomerania for a piece of land on the River Vistula, not far from its mouth. It was almost an island; and in this secluded spot Hyacinth wished to erect a convent, whose members should devote themselves to further enlightenment of those just rescued from idolatry. At first, the duke told him that the place was not suited to his purpose, for it was practically abandoned, and inaccessible. The fathers, said the prince, would be able to effect greater good, were they located more within reach of those who needed their assistance so sadly. But Hyacinth not merely held his ground, and won his point; he predicted that on this deserted spot would rise one of the most important cities in the north. This actually happened; for, about 1295, Przemyslaw, king of Poland, started there the present Dantzic, so well known for its commerce and manufactures. It is worthy of notice that, when, in the sixteenth century, the Lutherans gained possession of Dantzic, while they either destroyed all the other Catholic churches in the city, or converted them to their own or profane uses, they respected the one established by our saint. In 1739, when Father Touron published his book, the Dominicans still served the sacred edifice, but as a parochial church. They remained there until the expulsion of the religious orders from the German Empire. The success of Hyacinth and his disciples, their zeal, their holy lives, and the religious observance they established in their houses of prayer were a source of the keenest delight and interest to Gregory IX. To this fact, besides the testimony of historians, we have that of the Pontiff himself in the many bulls he sent to the Friars Preacher. In a brief (of 1231), addressed to the princes of Pomerania and other places in the north, he tells of the joy given him by the conversion of so many by the labors of these missionaries, and exhorts the leaders of society in those parts to be ever docile to the teachings of the fathers, that all may be permanently brought under the sweet yoke of Christ. Had Saint Hyacinth ceased from toil after his accomplishments in Pomerania and Prussia, he would still be one of the greatest missionaries the world has ever seen. But his thirst for the glory of God and the salvation of souls seemed insatiable. No sooner had he firmly established the missions of which we have just spoken, than he buried himself deeper in the northern forests. Denmark, Sweden, Gothland, Norway, and most likely Finland now became the scenes of his activity. Our Lord continued to follow him with the gift of miracles, which he did not hesitate to use in confirmation of his strong sermons against sin, idolatry, and superstition, as well as in favor of the Church of Christ. Success again crowned his efforts. But the holy man seems to have moved with greater rapidity here than in his former spheres of labor. Perhaps it was because he felt age creeping upon him, while the world was large, and he still looked for other fields of spiritual conquest. However, for he always had an eye to the future, Hyacinth took good care to build convents in those outskirts of civilization, and to people them with fervent religious who could carry on the good work, when he should have passed to other parts. Here we must pause in the historical part of our story, and consider a striking trait of Hyacinth’s character, which should not be overlooked, but to which we have hitherto scarcely called attention. It is his spirit of humility, prayer, penance, and mortification. The more God blessed his efforts, the more he prayed and sought to sink himself in self-annihilation. Like Saint Paul, he wished the glory of all that he did to be given to heaven. Like Paul also, he chastised his body, and brought it into subjection, lest, while he preached to others, he himself should become a castaway. It should not be forgotten that these travels, through which we have traced the apostle, were all made on foot. He nearly always slept on the bare earth, or a bard board. Frequently, even in the frozen regions of the furthest north, he was overtaken by night during his journeys, and compelled to use the snow for a bed. One marvels how he stood it. Withal, he slackened not in the observance of his rule, or in his practice of penance and mortification. From the extreme northwest of Continental Europe the man of God retraced his steps eastward, and passed into Little Russia. There, too, he made many conversions, the most noteworthy and helpful of which was that of Daniel, king of Ruthenia and an ardent adherent of the schismatical Greek Church. There can be no doubt but that the bringing of this sovereign into the true Catholic faith aided immensely in the work of converting his subjects, even if he did suffer politics to lead him back into his former way of error. Yet, it would seem, only an apostle like Hyacinth could have succeeded so happily with the Ruthenians; for obstinate schism, frightful moral corruption, and extreme ignorance prevailed among them. However, his patience and zeal triumphed over these obstacles. The night he gave largely to prayer; the day he spent in preaching, catechetical instruction, and the confessional. Rome had given the apostolic man every faculty for his missions, which he did not hesitate to use for the good of souls. He never lost any time. Thus, as God always came to his assistance with miracles, he could accomplish in the course of a few months what would take years for others to do. His stay in the country of King Daniel was not long. Yet he built a convent in Lemberg (or Leopold), on the Peltew, and another in Haliez, on the Dniester. Both of these houses not only became the parent of others; they also sent forth numerous missionaries to preach the faith far and wide. Many of them crowned their lives with glorious martyrdom. Some also were made the first bishops in dioceses afterwards established by the Holy See in places which the subject of our narrative won for the true fold. Our readers might fancy that surely the Friar Preacher’s zeal had reached its surfeit by this timeif we may use the expression, it was just getting a good start. From Little or Red Russia he passed eastward to the shores of the Black Sea or Euxine Sea. Thence he made his way southward into the numerous islands of the Grecian Archipelago in the Aegean Sea, that lies between Greece and Asia Minor. Later he proceeded north again, and entered ancient Muscovy which was called by the names of both Great and Black Russia. What fruits Hyacinth reaped from these missionary exploits it would be hard to say, for we have no authorities from whom to draw on this part of his life. Father Touron himself does not tell us. But we can rest assured that the saint did all in his power to bring souls to God and His Church. One may readily imagine, yet not easily portray, the hardships he encountered on these journeys, as well as the difficulties he must have experienced in his efforts against the superstitions, errors, and evil ways in which these barbarous peoples had been sunk for some centuries. Most likely our missionary left the Grecian Archipelago for Great or Black Russia on instructions from Rome, where the keenest anxiety prevailed to bring the Christians of that part of the north into communion with the Holy See. Be that as it may, he found there a medley of pagans, Mohammedans, and schismatic Greeks. Although they had a bishop, the Catholics were few in number, and without influence. They neither possessed a place of public worship, nor dared to make open profession of their faith. The situation fired Hyacinth’s zeal. Even though it had been hard even to civilize these northern hordes, he felt that it would not be impossible to convert them, if he could only bring their sovereign, Vladimir, into the Church. Redoubling his prayers and penances, therefore, the Friar Preacher sought to obtain an interview with the prince, either between themselves, or in the presence of the court, on affairs of the soul. It was a useless attempt. Education, schism, politics, and the influence of Vladimir’s counsellors combined to thwart every request for such a meeting. In none of his missions had the ambassador of Christ met with so strong an opposition. Another would have followed the advice of our Lord, shaken the dust of Russia off his feet, and gone to seek some more promising field of labor. Hyacinth did not lose courage. Probably in obedience to the Holy See, he resolved to undertake what seemed an impossibility; that is, to obtain permission to preach to the Catholics publicly. It was as much in acknowledgment of the saint’s eminent virtues, which none could but see, as in consequence of his incessant solicitations, that the prince eventually granted him even this favor. Hyacinth now began not only to preach, but also, as was his wont in such cases, to, confirm his teaching by miracles. The report of these soon brought crowds of pagans, Mohammedans, and schismatic Greeks to his sermons. It goes without saying that the few Russian Catholics and their bishop were more than delighted. Although the others doubtless went to hear him more out of curiosity than out of any desire to learn the truth, the grace of God began at last to enkindle the light of faith in many Souls. Amy number of pagans became Christians, while not a few others gave up their schism in order to be received into the bosom of the Catholic Church. As soon as such conversions, which included persons from every walk in life, justified it, our Friar Preacher began to stabilize his work, and to make preparations for its continuance, by the erection of a convent in Kiev (or Kieff), at that time the capital of both Russias. Then, with the assistance of confrères sent to him from elsewhere, he received subjects from among his converts and prepared them to perpetuate his apostolate. Meanwhile, the saint continued his mission of spreading the light of the faith. One day, as he passed along the banks of the Borysthenes, now called the Dnieper, he beheld a crowd of people, bareheaded and on their knees before an oak tree, on an island in the river. Ile knew at once that they were pagans engaged in their idolatrous prayers and sacrifices. Under an impulse of charity, as there was no boat at hand, he confidently crossed over the arm of the stream which separated him from them, treading on the water as though it were solid earth. So extraordinary a spectacle not only caused these benighted people to receive the messenger of Christ with joy, but also prepared them to listen to his instructions. Indeed, before he left them, they made a pyre of their idols, felled the oak which they had considered sacred, because the throne of their false deity, and embraced Christianity. The many conversions effected by our Friar Preacher and his confrères caused Prince Vladimir no little uneasiness. He was a headstrong member of the Russian or Greek schismatical Church, over which his position as leader of his dukedom gave him practically unlimited authority. The numbers embracing the Catholic faith made him fear a decrease of power in matters both spiritual and temporal. This was an erroneous notion, of course. Yet it led him to revoke the permission he had given to preach, and to begin a bitter persecution of the Church in order to undo the good work which the saint had accomplished. In this he was ardently abetted by politicians and schismatical clerics who had closed their eyes to the light. But Hyacinth and his co-laborers were not to be frightened by hardships. They were ready to seal their faith with their blood, and continued to preach the truths which bad been confirmed by many miracles. Like the apostles, with Peter at their bead, they declared: “We ought to obey God, rather than man.” Divine punishment was not slow in coming upon the leaders in this persecution. The early historians are one in the opinion that the unspeakable calamity which soon befell Kiev was a chastisement of it. Unawares a large army of Tartars, who spread terror through Europe in the thirteenth century, laid siege to the city. It was defended with heroism. Still, in the end, it was taken by assault, pillaged, and reduced to ashes. The missionaries were saved by a miracle. While the barbarians were engaged in the sack of Kiev and the butchery of its inhabitants, after the city had been captured, Saint Hyacinth, carrying a ciborium in one hand, and in the other a heavy alabaster statue of the Blessed Virgin which had appealed to him for protection, conducted his community in safety to the banks of the Dnieper. There he told them to follow him. He led the way, and they all walked dryshod across the waters of the deep river, which then protected them from the fury of the Tartars. All the Polish historians are one in recording this marvellous fact, although some of the later writers confuse it with the similar crossing of the Vistula mentioned earlier in our sketch. Possibly the remaining of the footprints [of Saint Hyacinth] on the waters of the Dnieper, which are also said to be still seen on the water of another river, will appear incredible to some. But, as says our Father Peter Ribadeneyra (Flores Sanctorum, Part II — Vita Sancti Hyacinthi –, page 418), nothing is impossible to God. Although this miracle appears most singular and stupendous, it is not beyond His power. Since, therefore, we know that the arm of the Lord is not shortened, and numerous witnesses have given sworn testimony that they have seen these footprints, we advisedly admit this marvel, however extraordinary it is. The Friars Preacher at Cracow claim that they have the statue of our Blessed Lady which Hyacinth carried away from Kiev. Some historians, however, say that he left it at the convent in Halicz, which was built in 1234, and that it was taken to Lemberg in 1414, when the archiepiscopal see was transferred thither from the former city. Be this as it may, the saint, for he was provincial in all those northern parts, placed at Halicz the youngest of the religious whom he brought from Kiev. The others he sent to preach in different places. Then he continued his way to Poland, delivering sermons in the various towns along his route. It was in 1241 when he reached Cracow on this return journey. He was then in the fifty-sixth year of his age. For nearly two years he now remained at the Convent of the Holy Trinity, possibly in part to rest his body after so many arduous labors, and in part to refresh his soul in the greater quiet of the cloister. He was rejoiced to find that the number of missionaries, largely through the ardor of Father James Crescenzi, bad much increased since he left the place, and that the spirit of regularity which he had established there continued to flourish. He was edified, as well as gave edification. All regarded him as a model after whom to pattern their lives. Even during this retirement, for his zeal and charity ever urged him on to help others, he preached to the faithful, and consoled the afflicted, whether spiritually or physically. It was apparently at this time that a distinguished lady, named Clementina, who lived at Kosczieliecz, some miles distant from Cracow, invited the Friar Preacher to preach to her vassals on Saint Margaret’s day. When he arrived at the village, on the eve of the feast, he found all the crops destroyed by a storm of wind and hail. Nothing bad been spared. To make matters worse, those who were prepared for an abundant harvest would now be unable to seed their fields for the ensuing year. Great want confronted everyone. The kindly lady who had invited him mingled her tears of sorrow with those of her dependents. A less sad spectacle would have sufficed to move Hyacinth to besiege heaven for the performance of a miracle to relieve suffering. But here he saw an opportunity of reaching the hearts of sinners by the unexpected. He persuaded the poor people to spend the night in prayer, and to have confidence in the fatherly goodness of God. His own supplications blended with theirs. To the surprise and happiness of all, when the sun rose the next morning, every sign of disaster had disappeared. The grain was in as good condition as before the storm. Quite naturally, the holy man’s sermon bore rich fruit among these poor people. Two other miracles, which, it would seem, belong to this period of his career, we may mention as illustrating the general course of our saint’s life. As he entered the cathedral of Cracow to preach, a distressed mother placed before him two blind children who had been born without even eyes. The man of God made the sign of the cross over them, and at once both became normal. In the same city there lived a distinguished man and his wife, who, like Elcana and Anna (I Kings, Chapter 1), had no children. This circumstance rendered their married life unhappy, for they had no natural heir to whom they could leave their fortune. In her sorrow, the wife, Madam Felicia Gruszouska, went to Hyacinth to beg his prayers that God might bless her with a son. Having made his usual sign of the cross over her, he told the lady to be of good cheer, for heaven would give her a male heir who would be the progenitor of many bishops and princes. History proved the truth of his prophecy. The houses which the saint himself founded, or caused to be built by others, in Poland and the northern countries (especially in the two Russias) were divided into two historical provinces, of which he is justly considered the father. A Polish historian, who wrote his life from reliable sources, is quite positive in his declaration that the subject of our narrative long governed all these convents in the capacity of provincial; and this statement is substantiated by an ancient document in the priory of Lemberg. Some writers of the seventeenth century, it is true, do not accept this conclusion. But the argument on which they base their stand tends rather to refute their opinion. They tell us that his missionary journeys and engagements would not have permitted him to attend to the duties of a provincial. On the contrary, however, it was precisely the rapidity with which he passed from place to place that enabled him to visit so many monasteries scattered in such widely separated localities. Almost any other man would have been appalled by the very thought of the endless travel the position necessitated. As a matter of fact, after somewhat less than two years spent in Cracow and its vicinity, the tireless Friar Preacher started on another tour of the north and extreme northwest, where he had either established, revived, or strengthened the faith. Sweden, Denmark, and the other countries, through which we have traced him, were not forgotten. Everywhere his memory was still treasured. His presence aided his own confrères, no less than the faithful. Through his preaching new members were added to the convents, and the fold of Christ was increased. Possibly some other religious houses rose along his path. Hyacinth was a character to whom Saint Dominic would hardly have failed to reveal his wish to consecrate himself to missionary work among a people then known as Cumans. They were a wandering race, who seem to have made their principal habitat in a stretch of country extending from northeastern Hungary and Roumania into adjacent parts of Russia. A desire to bring this people into the fold of Christ was inherited by more than one of the early disciples of the founder of the Friars Preacher. Father Paul of Hungary (chosen by Dominic himself for this apostolate) and his companions had already sown the seed of faith there. Thither Hyacinth also turned his mind on his return from the missionary tour described in the preceding paragraph. Possibly he resigned his provincialship for that purpose. With his usual zeal he began to toil hand in hand with his confrères. But, as he saw there was no special need of his labor in those parts, because of the number engaged in the mission, he soon cast about for some more distant center of action. The Tartars had driven him from Kiev, and largely destroyed the fruits of his labor in that part of Russia, where everything yielded to their arms. Why not, therefore, thought the saint, carry the sword of the cross into their own country? With the permission of his superiors, he now made his way to the very strongholds of this barbarous and warlike people. We are told that, through his miracles and holy life, he converted several thousand of them to the Christian faith. Father Michael Pio tells us that a prince of Tartary was among Hyacinth’s converts, and that this leader, together with a number of his followers, attended the first council of Lyons (1245), and was baptized there. No proof of this statement can be found in the history of the council. On the contrary, we know that it considered measures for repressing the ceaseless and bloody incursions of these barbarians into Europe — particularly Poland, Russia, and Hungary. It is true that, in 1248, ambassadors of the great Tartar sovereign visited the French king, Saint Louis, in the Island of Cyprus. They said that their khan had become a Christian, and had sent them to offer assistance against the Saracens, who were no less enemies of the Tartars than of the Christians. The letter of the Tartar sovereign was given to Father Andrew de Longjumeau, O. P., to read; for he had been a papal envoy to Tartary, was acquainted with one of the ambassadors, and knew their language. This fact, recorded both in ecclesiastical history and in the Life of Saint Louis, shows that Christianity was preached to these fearless barbarians, before whom the world trembled, prior to 1248. It is also proof that Hyacinth was neither the first nor the only Friar Preacher who labored for their salvation. Writers generally suppose that he was alone on this mission. Yet rarely did the sons of Saint Dominic take long journeys without companions. In any case, however, it seems certain that he remained longer among these intractable people than any of his confrères. Doubtless, too, for he was a man whose tireless zeal God ever supported with miracles, he made more conversions among them than any other. Our Friar Preacher traversed a large portion of the immense stretches of Tartar territory. Then he made his way to the old Kingdom of Thibet, and continued his course northeast to Cathay, or the uppermost part of China. Everywhere the apostolic man preached redemption and salvation through Christ crucified. Everywhere he strove with all his might to revive the spark of faith which missionaries had enkindled there in the early centuries, but which war, persecution, paganism, and time bad combined to extinguish. Ambassadors of Christ, who traversed these regions in after times, found traces of Catholicity still in existence. Our readers, we can but fancy, have marvelled at the prodigious labors and travelling of Saint Hyacinth, although we have given only a meager account of them. They extended over a period of nearly forty years, and carried him through a large part of Europe and Asia. Doubtless, if they were recorded in detail, and in proper sequence, they would be found infinitely more stupendous than we have painted them. He alone could have told them as they should be recounted. Yet it possibly never entered his mind to leave posterity any information on his life. The one thing that engaged his thoughts was, after saving his own soul, to help those of others, to make God known, and to extend the kingdom of Christ. The same idea filled the minds of the confrères who were often his companions in labor. In this way, it was only through the scanty records discovered in cities and the early convents that historians have been able to tell us the little we do know about him. Still perhaps never was there a life which should be more completely written than that of Saint Hyacinth Odrowaz. From the east the missionary made his way back to Poland, travelling and preaching as he had done on the outward journey. Soon we find him again in Red Russia, where his efforts seem to have borne as much fruit as they had done in his younger days. Among the conversions he now made was that of Prince Coloman (or Koloman) and his wife, Princess Salomea. Not merely did the saint bring them out of schism into the Church; through his guidance they were led to the practice of heroic virtue. At this period of his life, he gave practically all his attention to Volhynia, Podolia, and Lithuania. The people flocked in enormous numbers to hear the sermons of the Friar Preacher. Convents arose under his influence. That at Vilna, then the capital of the Duchy of Lithuania, became the chief house of a large Dominican province, whose members labored most earnestly for the spread or preservation of the faith in the northern parts which he had evangelized. The repute of Hyacinth’s sanctity, zeal, goodness of heart, self-sacrifice in behalf of religion, and what he had done for the Church, combined with the consequent love and veneration in which he was held not only to spur these religious on in their labors, but also to render the people more responsive to their efforts. It is no wonder that the Catholics among the Slavonic races look upon Saint Hyacinth as the apostle of their various countries. In Poland especially he is as deeply loved as Saint Patrick in Ireland. No doubt this veneration has contributed not a little towards maintaining the inhabitants of that country true to the faith. The influence of his labors in Russia may be seen from the mere fact that, from 1320 to 1439, all the bishops of Kiev were taken from the Order of Preachers. There were six of them in succession. Everyone had absolute confidence in the saint’s goodness of heart and power of miracles. An example of this is shown in Princess Przybislauska, a pious lady, who sent her only son to ask him to preach at Zernitz, not far from Cracow. Hyacinth consented, and said that he would start for the place in a short while. When on his way home, the young man accidentally fell into the River Raba, and was drowned. On reaching the stream, our Friar Preacher found the princess almost in despair over the loss of her child, who had been taken from the water. Moved to compassion, the saint said a prayer. Then, taking the youth by the hand, he commanded him to rise, and gave him to his mother. This was perhaps the holy man’s last miracle. The great missioner knew perfectly well that not only were his days of labor over, but also that he was near the end of life’s journey. Like Saint Paul, he welcomed the dissolution of his body; for then his soul would be united to God, whom he had served so long, so faithfully, and with so much good to others. His communion with our Lord and our Blessed Lady were more intimate and tender than ever. Historians tell us of his great devotion to the Mother of God, and assure us that he received many of his greatest blessings through her. Now he placed himself under her protection in an especial manner. His last illness was not long. On August 14, 1257, he called the community of the Holy Trinity, Cracow, to his bedside. Then he addressed them somewhat after this fashion. “My dear brothers, the time has come at last, when I must leave you. God calls me, and I must go to Him. Do not be sad, for I only go to join Christ our Lord. I have always loved you on earth. I will not cease to love you in heaven. Continue to strive to prepare a place for yourselves there; for you know our Saviour never refuses such a blessing to those who are faithful to grace, and persevere in His service until the end. That which our holy father, Saint Dominic, bequeathed to me I leave to you. Weak as he was, Saint Hyacinth attended the matins, and perhaps prime and tierce, of the divine office in choir on the morning of August 15. Then, because unable himself to offer up the holy sacrifice, he attended the community mass, after which he received communion at the foot of the altar. It was also the viaticum for him. Indeed, the prior, thinking that he was in the agony of death, gave him extreme unction in the same place. The holy man was anxious to die there. But his confrères persuaded him to let them carry him to his cell, where he died a few hours later in transports of love, while saying the psalm: “In thee, O Lord, have I hoped. Let me never be confounded. Deliver me in thy justice.” He retained perfect consciousness until the end. The Blessed John Prandota, then bishop of Cracow, went to the church of the Friars Preacher just as soon as he heard of the death, in order to pay his last respects to one whom he regarded as a saint and treasured as a friend. Indeed, not only the city but even the entire diocese of Cracow was cast down by sorrow, which was equally felt by rich and poor, high-born, freeman, and serf. We have given the foregoing facts, dear candid reader, for the contemplation of the devout and for the glory of the holy man of God, Saint Hyacinth. His every act was consecrated to the propagation or maintenance of divine truth, or to enkindling devotion in the hearts of the faithful. These facts are drawn from original and authentic sources used in the process of the saint’s canonization. We have been very brief in the presentation of the miracles effected by him, lest a complete list of them, because it would be exceedingly long, should prove tiresome to many. Yet we have sought to include enough of them to give a good idea of this extraordinary man, and to show how God was ever with him. In fine, though in as short a space as possible, we have endeavored to do him a justice which can but redound to the glory of the Almighty. In the cause of brevity, for instance, we omitted visions and apparitions of Saint Hyacinth at various times to different sick persons. We counted thirty-six of these from the original documents used for his canonization. Similarly, and for the same purpose, we passed over thirty witnesses to his sanctity and holy life in general. We felt justified in this course, for the reason that fathers of his Order and other men, who are absolutely trustworthy, and are described in the process of his canonization, mention almost innumerable prodigies performed by the blessed servant of God for the spiritual welfare of the faith. These marvels are in addition to those given in writing and universally sworn to by the witnesses called for his canonization, as recorded in our pages. In other words, we largely confined ourselves to miracles juridically attested. Yet we trust that we have left out nothing that might add materially to a knowledge of the saint’s life, character, and virtue. One may consider the practical, lively faith of the Poles, whether in the home land or in others, as a perpetual miracle of Saint Hyacinth. In no small measure they owe it to him. To that keen faith we must attribute the magnificent institutions of learning, charity, benevolence, and the like, as well as the churches, monasteries, and similar edifices, in which Poland abounds, and in which it has found expression. All these are filled with the spirit which the people largely derived from him. They simply thrill with love and gratitude for him. This true spirit of Catholicity, we must remember, has been preserved undiminished for centuries through wars of every kind, division, hardships, persecution, and every sort of oppression-the like of which the world has seen few parallels. We have here, it would seem, the greatest miracle of the zealous apostle’s life. At least, it has contributed more to the glory of God, the good of the Church, and the salvation of souls than any miracle he performed. Throughout the northern countries our saint found paganism, or idolatry, or atheism, or moral corruption, or schism, or superstition. In some places there was a mingling of all these evils. He soon learned from experience that they were often largely a result of ignorance, for his converts were ever ashamed of their former error. Accordingly, the holy man left nothing undone that the people might be enlightened. This was one of the reasons why he was so careful to establish houses of his Order wherever he could. Like Saint Dominic, through a special gift from heaven, he soon prepared those whom he clothed with the religious habit to carry on the work of instruction. His was a pre-eminently constructive genius. How well he laid his foundations, and how thoroughly he trained those whom he received into the Order, may be seen from what we have now to relate. Not a few of them died a martyr’s death. Several became bishops in those northern lands. Indeed, for two hundred years after lie had ended his earthly career, subjects of the convents lie founded continued to be chosen for the miter. Among his immediate disciples thus honored we may mention one Father Vitus, whom Mindowe, duke of Lithuania, had appointed bishop of his duchy. After the murder of Mindowe, the prince’s eldest son, Vaisvilkas, began a persecution of the Catholic religion, and compelled the holy prelate to leave the country. He retired to the Convent of the Holy Trinity, Cracow, where he died before Saint Hyacinth. Bzovius (or Bzowski) claims that miracles were wrought at Vitus’ tomb. Enormous numbers of apostolic Friars Preacher, in fact, went forth from Saint Hyacinth’s convents or schools, both before and after his death, to spread the light of the Gospel, or to die for the faith, far and wide. As has been noticed, bulls of Gregory IX and Innocent IV give eloquent testimony to the ardent zeal and extensive labors of those who toiled in Hyacinth’s own time. His confrères in the north, in concert with the Polish sovereigns and grandees, began to urge the saint’s canonization shortly after his death. Still, owing to distance, slow and difficult communications, wars, the death of various Popes, and other tantalizing causes of delay, the case dragged along for more than two hundred years. Finally Lutheranism, with its condemnation of the cult and invocation of saints, and the danger with which it threatened Poland, aroused the zeal of Sigismund I and his successors on the throne. By them, rather than by some of the Polish hierarchy, was Hyacinth’s cause then ardently advocated. The people at large were most anxious to see him elevated to the honors of the altar. Clement VII beatified the great missionary, and granted his office and mass to the Friars Preacher and all the dioceses of Poland. This was in 1527. The Holy Father could hardly have given the northern Catholics greater joy. In 1543, the Most Rev. Peter Gamrat, archbishop of Gnesen, having had a chapel erected in the Dominican Church of the Holy Trinity, Cracow, for the purpose, the first translation of Hyacinth’s relics took place. It was an occasion of gala, not for the city and diocese only, but for the entire country as well. In 1583 there was a second solemn translation of his relics, under the supervision of the Right Rev. Peter Miszkowski, bishop of Cracow. At this time, they were exposed on the altar of Archbishop Gamrat’s chapel for the veneration of the enormous crowds who flocked to the sacred edifice for the event. The cup of spiritual joy for all the Catholics in northern Continental Europe, not less than that for those of the Polish tongue, was finally filled by the formal canonization of the saint. This took place on April 17, 1594, under Clement VIII. It was not without reason that the papal bull for the occasion declared that the miracles performed by Hyacinth were “almost countless.” It is quite possible that the multiplicity of these wonders, together with the extraordinary character of many of them, was in part the cause of the long delay in according Hyacinth so signal an honor; for Rome, in her usual prudence, wished to have them thoroughly examined before she placed on them the seal of her sanction. However that may be, the action of Clement VIII met with universal favor. Prayers of gratitude rose to heaven everywhere. Poland and the Order of Preachers, as was but natural, outdid the rest of the world in their solemn celebration of the event. Other marvels now added to the renown of the new saint. In consequence of all this, February 1, 1625, Urban VIII extended his feast to practically the entire Church, with the rank of a duplex, and set August 16 as the day for its observance; but it has lately been transferred to the seventeenth of the same month. As a crowning glory of the Friar Preacher, Hyacinth was finally declared a patron saint of the Polish Church and people.